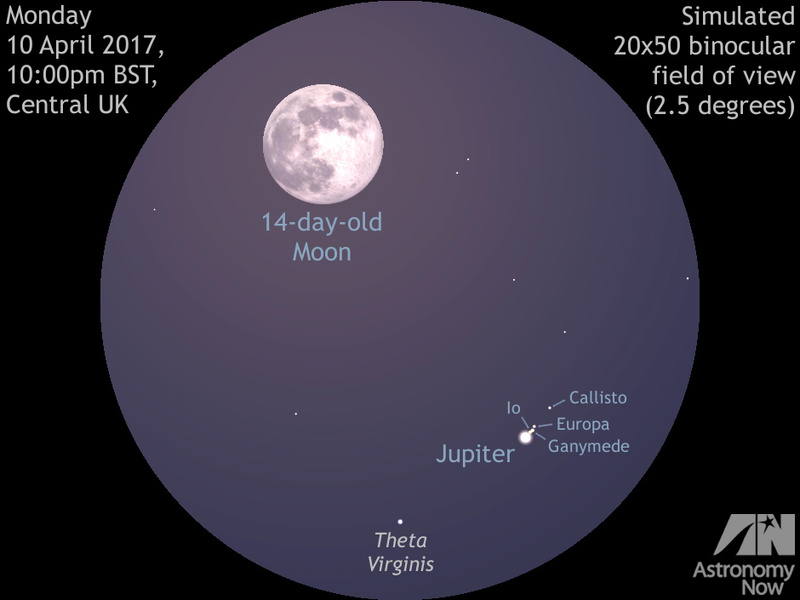 On the evening of 10 April the Moon and largest planet Jupiter lie just 1½ degrees apart, so telescopes and binoculars employing magnifications of 30x or less will show the pair in the same field of view. On this night the four Galilean moons all lie on the same side of Jupiter, in the order (outward from the planet) Io, Ganymede, Europa and Callisto. AN graphic by Ade Ashford. As darkness falls around 10pm in early April for the UK, even casual stargazers cannot fail to notice the prominent magnitude -2.5 ‘star’ low in the southeast, an object that has more than twice the luminosity of brightest nighttime star Sirius sparkling low in the southwestern sky. Careful observation of the interloper in the southeast reveals that it is moving slowly with respect to the background stars of Virgo from night to night. This object is Jupiter — the largest planet in the Solar System. As the spacecraft Voyager 1 approached Jupiter in early 1979 it photographed the planet every Jovian day (approximately 10 hours) over 28 days. Each frame of this looping movie shows Jupiter at the same local time with the Great Red Spot appearing stationary within its cloud belt while clouds move right to left past it; other cloud belts move left to right. The small, round, dark spots appearing in some frames are the shadows cast by the moons passing between Jupiter and the Sun, while the small, white flashes around the planet are the moons themselves. Movie credit: NASA. Jupiter reaches opposition to the Sun on the evening of 7 April and lies closest to Earth at 21:28 UT the following night — some 4.4549 astronomical units, or 414.1 million miles (666.4 million kilometres) from our planet. This is when Jupiter’s angular size peaks at 44.3 arcseconds, meaning that a telescope employing little more than 42x magnification is required to enlarge Jupiter to the same apparent size as the full Moon seen with the unaided eye. Jupiter is more massive than of all the other known planets of the Sun’s family combined. Eleven times the diameter of our planet, more than 1,300 Earth’s could comfortably fit within its enormous bulk. This planetary behemoth is largely composed of hydrogen and helium under gaseous and liquid states. Jupiter’s composition and fast rotation period of under ten hours give it a noticeably pot-bellied appearance. 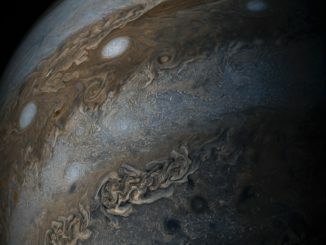 A world with turbulent weather systems, Jupiter’s upper cloud layers provide an ever-changing tableau for owners of four-inch (10-centimetre) telescopes and larger when the planet is highest in the sky (currently about 1am BST for the centre of the British Isles) and seeing conditions are good. The dates and times above are when Jupiter’s Great Red Spot (GRS) lies on the planet’s meridian — the imaginary north-south line bisecting Jupiter’s disc. Owing to the planet’s fast rotation, note that the GRS will still be well placed for observation up to an hour before or after these optimal times. A montage of Jupiter’s four Galilean moons, in a composite image comparing their sizes and that of Jupiter and the Great Red Spot. From left to right: Callisto (diameter 2995 miles), Ganymede (3270 miles), Europa (1940 miles), Io (diameter 2274 miles). Image credit: NASA/JPL/DLR – NASA planetary photojournal. As befits the King of the Planets, Jupiter is accompanied by an impressive retinue of 67 natural satellites at the last count. 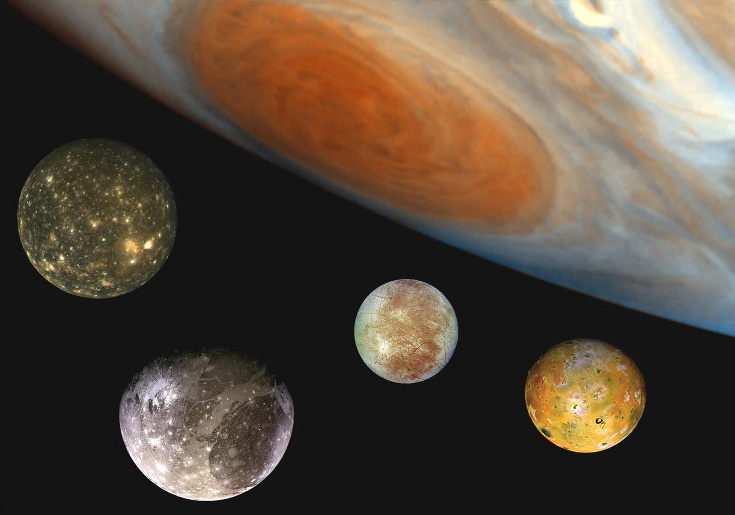 The largest of these by far are the so-called Galilean moons — Io, Europa, Ganymede and Callisto — discovered by Galileo Galilei in 1609/1610. Europa, the smallest of the ‘big four’, has a diameter slightly less than our own Moon, whereas the largest (Ganymede) exceeds planet Mercury in size. The Galilean moons are so conspicuous that quality binoculars will reveal them when furthest from their parent planet (see the illustration at the top of this page for 10 April). Io, Europa, Ganymede and Callisto continually play cat and mouse as their orbital motion cause them to alternately pass in front of (transit) Jupiter or be hidden (occulted) by their parent planet or its shadow. Furthermore, the shadows of the Galilean moons frequently fall on the cloud tops of Jupiter, visible in modest (3-inch, or 7½-centimetre aperture) telescopes of good quality at magnifications of 100x or more as inky black dots slowly drifting across the face of the planet. The table above summarises the phenomena of Jupiter’s moons Io, Europa, Ganymede and Callisto visible from the UK for the month ahead in British Summer Time. Key: I = Io, E = Europa, G = Ganymede, C = Callisto; ‘tra’ = transit; ‘sha’ = shadow; ‘occ’ = occultation; ‘ecl’ = eclipse. For example, ’14 Apr 2017 11:28pm G sha start’ means that on 14 April 2017 at 11:28pm BST, Ganymede’s shadow starts to cross the face of Jupiter. Furthermore, ’02 May 2017 09:31pm G occ end’ means that on 2 May 2017 at 9:31pm BST, Ganymede reappears from occultation behind Jupiter. Based on data generated by Guide 9.1 and formatted by Ade Ashford. Predictions for the start and end times of Galilean shadow transits, plus information on their eclipses and occultations for any given date in a slightly more user friendly format may also be obtained through our Almanac. To see the satellite events for any given day, ensure that the ‘Add phenomena of Jupiter?’ checkbox is ticked. Like the Great Red Spot predictions, all Galilean moon phenomena events are in Universal Time (UT). For help using the Almanac, see this article. 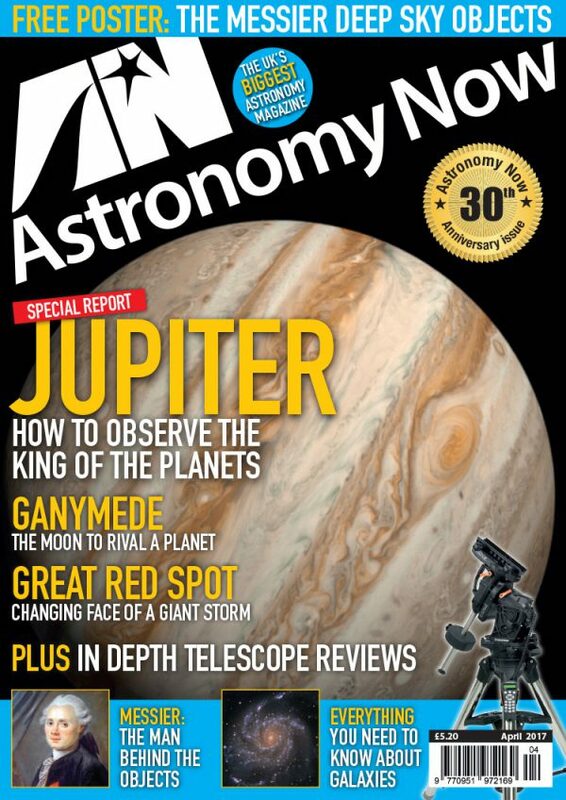 For a comprehensive guide to observing all that is happening in the current month’s sky, tailored to Western Europe and North America, obtain a copy of the April 2017 edition of Astronomy Now. This enhanced-color image of Jupiter’s bands of light and dark clouds was created by citizen scientists Gerald Eichstädt and Seán Doran using data from the JunoCam imager on NASA’s Juno spacecraft. 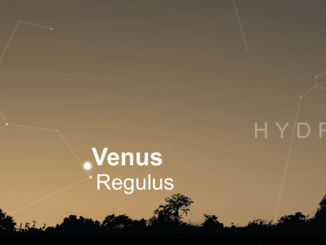 Venus has a close encounter with first magnitude star Regulus, constellation Leo’s luminary, in the dawn twilight on the mornings of 5 and 6 September.